As more and more stores are shifting their Black Friday holiday kickoffs into Thanksgiving evening, as well as offering better deals online, the National Retail Federation is predicting that fewer people will flock to malls. But it’s likely they will spend more, and BDO is forecasting a 3.1% bump in Black Friday sales. The NRF says it expects some 147 million people to brave the Friday shopping crowds, down from 152 million last year. 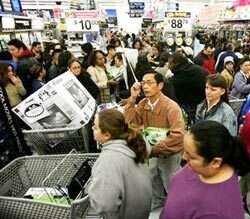 That includes 71 million who say they definitely plan to shop on Friday, and another 76 million who intend to venture into stores at some point over the weekend. And just as more stores are offering better deals online, consumers seem more motivated to keep up by using digital devices: 26.8% say they will check out retailers' Web sites, and 31.4% will use emails from stores to keep up with deals and promotions. Half say they will rely on advertising circulars, and 30.5% say they are counting on TV ads to keep them informed. Meanwhile, stores have high hopes for sales gains this year. BDO, which has been polling retail CMOs about their expectations for the holiday, now says these executives expect a 3.1% gain in Black Friday sales. Last year at this time, the CMOs expected a gain of just 1.6%, although actual sales came in at record pace. Other signs of CMO optimism? They expect Cyber Monday sales to jump 4.3% above last year’s results, when sales on that day hit $1.25 billion. And overall, this group expects to see lots of sale prices and promotions, with 66% predicting consumers will see more discounted prices over Black Friday weekend. And while 44% of the execs in its survey say they are devoting equal emphasis to their online and in store programs, trying to provide a more seamless brand experience, the majority tell BDO they will offer more deals in stores. Walmart, Target, Sears and Toys R Us have all said they will open on Thursday evening, despite growing complaints from associates. 2 comments about "Less Store Traffic As Black Friday Shifts To Cyberspace ". shawna hill from Revlocal, November 19, 2012 at 7:42 a.m. I personally like to shop online and did so this past weekend, taking advantage of exclusive online specials. I enjoyed the experience so much better than milling through crowds that it may be the way I go from this point on. Kevin Horne from Lairig Marketing, November 19, 2012 at 5:42 p.m.